CARRBORO -- After facing a charge of violating free speech, town officials appear ready to do an about-face. In a May 30 letter to the town, Joe Herzenberg of the local American Civil Liberties Union protested prohibitions on political activity at Carrboro Day in May and at a recent Farmers' Market. Alderman Jacqueline Gist said Thursday that she planned to redress the wrong at the aldermen's Aug. 13 meeting, their first after a six-week summer recess. "I think we made a mistake [at Carrboro Day], and we'll fix it. I don't believe in restricting people's rights of free speech. It looks like we did that and we won't do it again," Gist said. Gist said she found it curious that Carrboro, known for liberal leanings, finds itself in this position. "We defend the right of people to panhandle," Gist said. Herzenberg , an ACLU board member and former Chapel Hill Town Council member, said he got calls from three people who said they were told by town officials to stop distributing campaign literature at Carrboro Day. One of the two people handing out literature for county commissioner candidate Margaret Brown was Brown's husband, Robert. Another person was distributing literature for former Carrboro Mayor Ellie Kinnaird, a candidate for state Senate District 16, Herzenberg said. "Prohibition of political speech is a clear violation of the First Amendment. 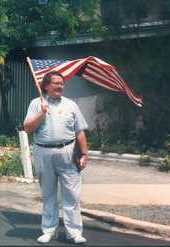 Political speech enjoys the highest level of protection," Herzenberg said Thursday. In addition, someone told Herzenberg another person was "basically chased away from the Farmers' Market" after collecting signatures on a petition backing Green Party presidential candidate Ralph Nader, Herzenberg said. Town Manager Robert Morgan said that political activity was against the rules of the Farmers' Market and had been so for about 12 years. The market is intended to be a marketplace of produce and crafts only, Morgan said. "The Farmers' Market has a regulation in which they don't allow outside groups to hand out literature. They've just excluded all outside groups not associated with the market, which would include political activity," Morgan said. Town attorney Mike Brough is looking into the matter to see if the town is in violation of the First Amendment, Morgan added. Brough could not be reached for comment Thursday. As for Carrboro Day, Morgan said, "It was the desire of the Carrboro Day committee that people not politick at that event. Some people feel harassed by that kind of stuff." Initially, Carrboro Day was supposed to be held in September before the November elections, and planners feared that people attending the event would be overrun by people campaigning -- "like shooting fish in a barrel" Gist said. "We asked people not to do that," Gist said. "We shouldn't have. We could have just asked people not to be overzealous." Herzenberg said that after he received the complaints he was dismayed to the point of depression about what he saw as a violation of First Amendment rights by people he thought would not do that. "The people on the Carrboro Board of Aldermen are pretty progressive," Herzenberg said. CARRBORO - The town that many view as a bastion of liberal activism stands accused of barring free speech. 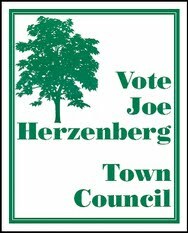 Joe Herzenberg, a board member of the local American Civil Liberties Union chapter, said he fielded calls from three people who were told - in at least one case by a town alderman - to stop distributing campaign literature during Carrboro Day, a town-sponsored event held on town property in May. Herzenberg said he had also been told another man was asked to leave the Carrboro Farmers Market, also held on town property, after soliciting signatures for a political petition. 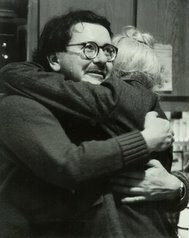 In late May, Herzenberg sent the Board of Aldermen a letter protesting the Carrboro Day incidents. The board briefly discussed the letter June 25, but didn't act. So far the ruckus has been low-key, but it may be about to expand. Herzenberg plans to raise the issue at an ACLU board meeting Tuesday night. Two of the campaign workers at Carrboro Day were distributing palm cards for Orange County commissioner candidate Margaret Brown. She said the volunteers, one of whom was her husband, Robert, were told to stop, not simply asked. "It wasn't a choice," she said. "Robert asked if it was." Senate District 16 candidate Eleanor Kinnaird, a former Carrboro mayor, said she had planned to hand out literature, too. But when she arrived, she heard Robert Brown complaining about what had happened and decided not to try. Kinnaird finds it ironic that something like this would happen in Carrboro. "I would say one of the most special qualities about the town is political speech - vigorous political speech - and strongly coming to the government and trying to get things done." Green Party volunteer Mark Marcoplos says the problems with speech restrictions include the weekly Carrboro Farmers Market. Marcoplos said that on July 20 he was collecting signatures on a petition backing Green Party presidential candidate Ralph Nader, when the on-site manager of the market told him political activity was against the rules and asked him to leave. Herzenberg said the issue of whether electioneering should be allowed at the market is murkier, because the town's agreement with the market may allow the vendors to enforce such rules. Town Manager Robert Morgan, who oversees the town's relationship with the market group, said the rule against political activity has been in place for years, since before the market moved onto town property. "Those are the rules and regulations of the market," he said. "It's not an issue we've looked at in several years, and it might be something I need to raise with the town attorney." Town Attorney Mike Brough couldn't be reached Wednesday. Carrboro Day was envisioned as an eclectic arts and crafts celebration with an emphasis on town history. This year's was the first, but the event was supposed to have made its debut in 1995, just before a round of hotly contested town elections. Fearing it would be dominated by politicking, the town-appointed Carrboro Day Committee sent a letter to local pols, asking they they not campaign there. Alderman Jacqueline Gist, one of her board's liaisons to the committee, said Herzenberg's letter may have exaggerated a little. She doesn't think anyone was thrown out of Carrboro Day. But she agrees that politicking should be allowed. "I got Joe's letter and said, 'Damn, he's right. We can't tell people what not to tell other people. That's not what Carrboro's about.' "
She says the board may try to change the policies at both Carrboro Day and the Farmers Market. "I think both things are kind of unforeseen consequences of what were probably well-intentioned rules," she said. "Knowing my board, this will come up at the next meeting and we'll fix it, simple as that." 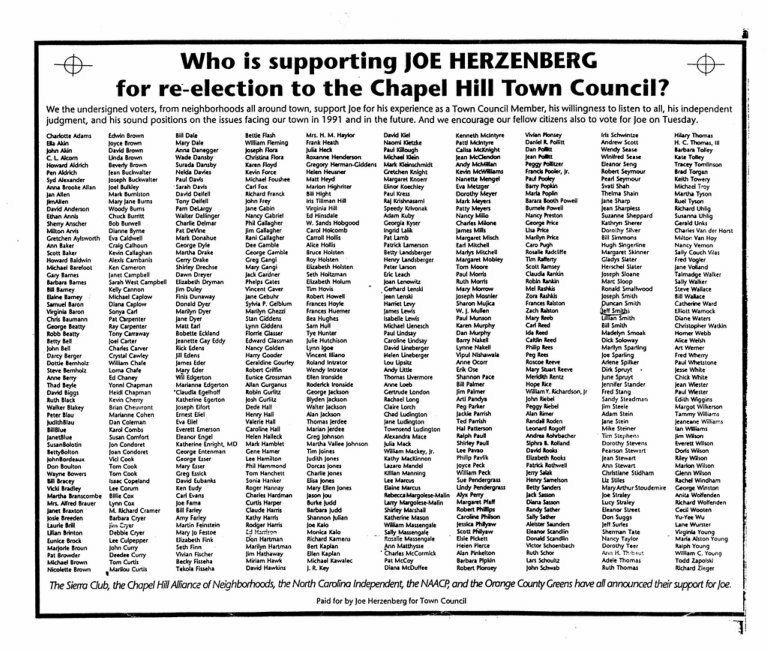 Mayor Mike Nelson was the only board member to back Herzenberg at the June 25 meeting. He also says politicking should be allowed at Carrboro Day, though he understands the committee's sentiment. "Everybody makes mistakes, and I think this was a mistake, and that it won't happen again," he said.